First, a disclaimer. 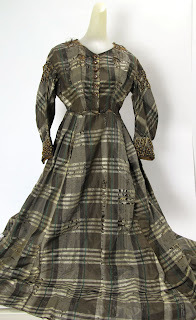 I am not an expert in 19th century fashion, and may miss dates or terms in this description. 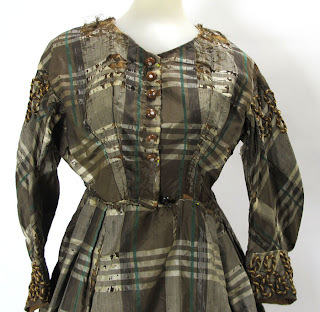 I have spent a long time looking at images resulting from search terms such as "Victorian Sleeve Fashion" and am trying to distill what I saw as best I can, so please bear with me for any shortcomings. I will describe what is here as best as I can, and go from there. 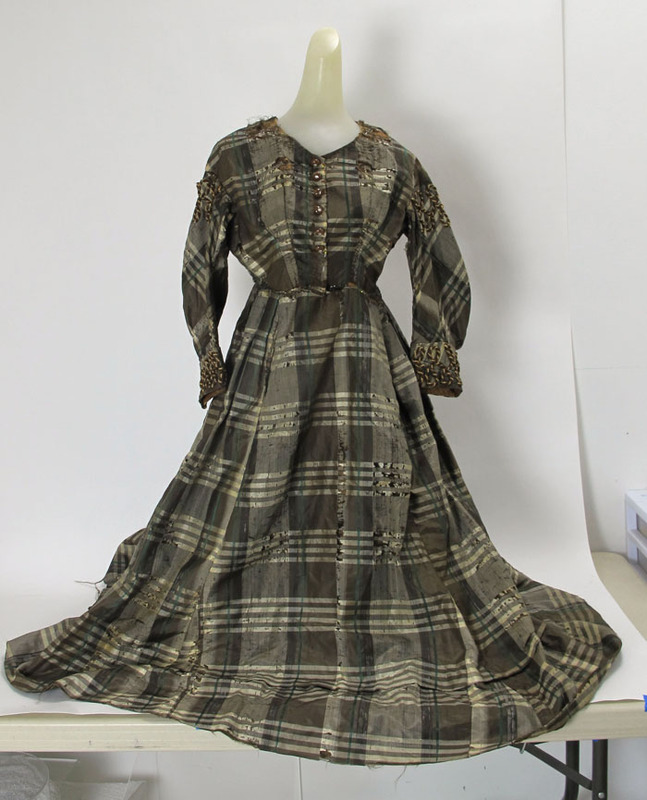 We acquired this dress at an auction that identified it as coming from the Historical Society of Frederick County, Maryland. The dress is one piece, as opposed to a bodice separate from the skirt. This dress is made of silk, according to our source, and lined with what is probably cotton. 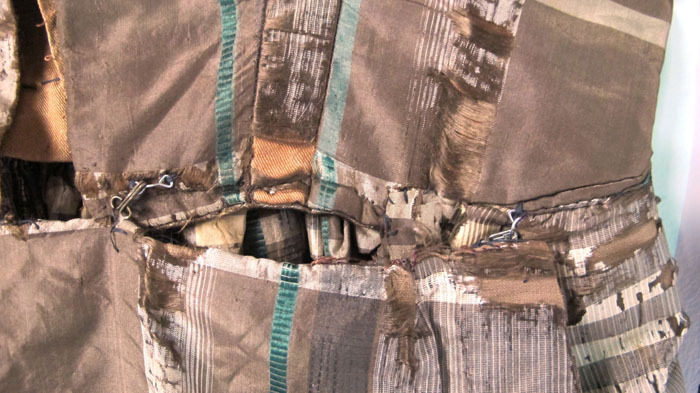 The seams are machine stitched together, but the finish work was done by hand, including constructing a pocket that is sewn into a seam. 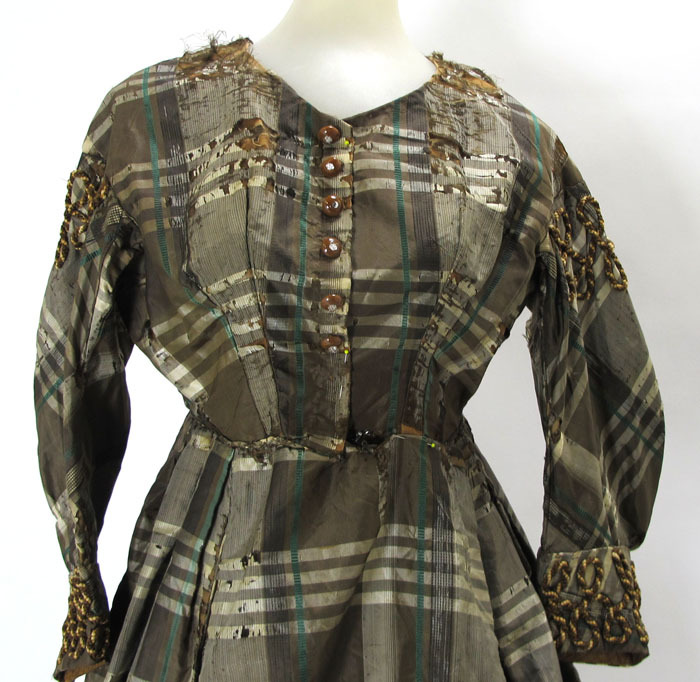 The dress is designed with a modest round neckline without a collar. The material is a brown plaid, with green accent lines. 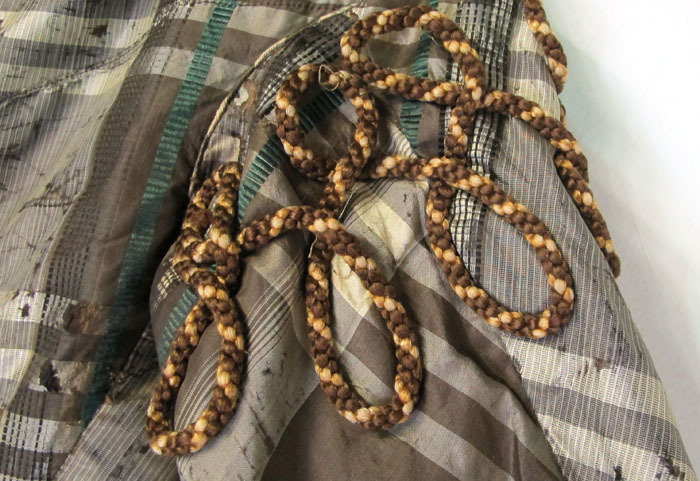 Brown was a popular color in the late 1800's. The front opens and is fastened with metal hooks and eyes, while six lovely glass buttons are sewn on for decoration. 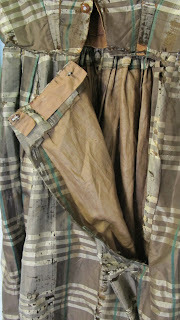 The sleeves are three quarter length, with a sleek straight design as opposed to the puffy sleeves of earlier styles. 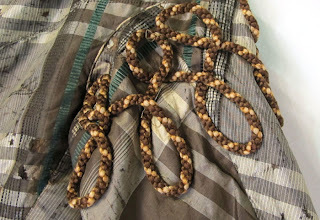 The sleeves have braid hand sewn on in double loops at the shoulder and at the end of the sleeve. 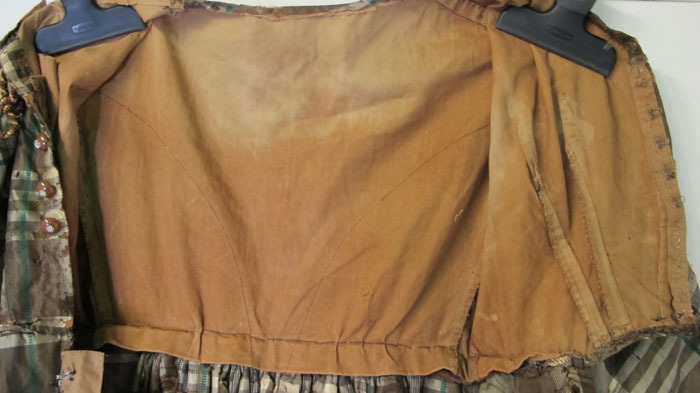 The skirt is heavily gathered at the back of the dress, while the front is designed with several small pleats. The dress measures approx. 36" at the bust, 31" at the waist, and 48" from the center of the neck to the hem. Across the shoulders, it measures approx. 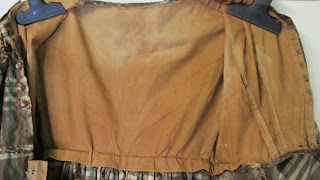 16" and the length of the sleeves is approx. 19.5". 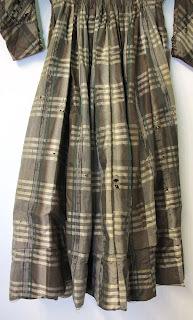 The hem of the dress is wide! Approx. 137" in circumference!! It would seem safe to say that this was meant to be worn with hoop skirts. 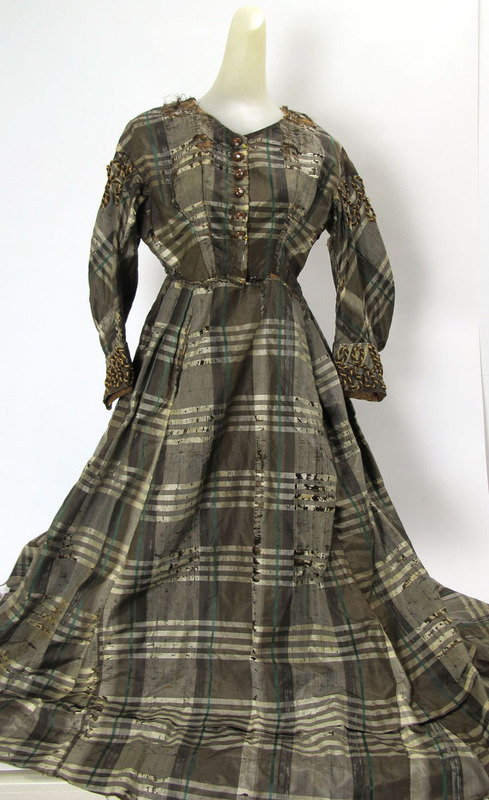 While this is an amazing example of 19th century dress design, it shows age all over. 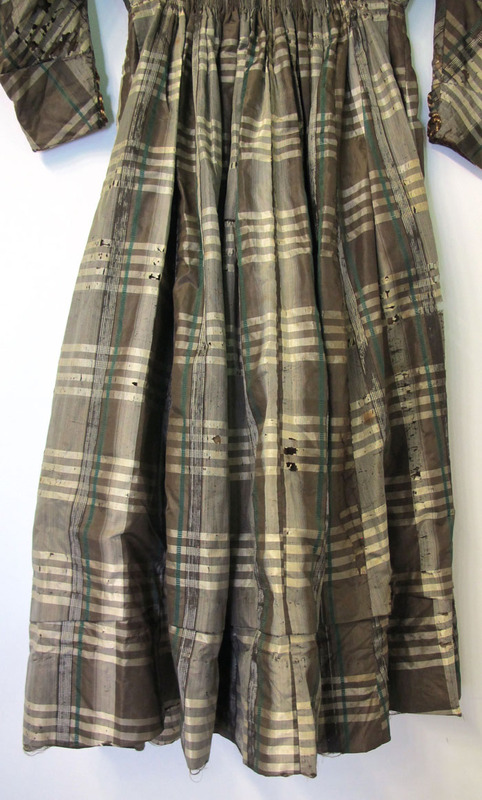 There are stains, missing fasteners, etc. While there are six buttons, two of them are damaged, one missing a chip of glass, the other missing the clear glass center. It appears that there were eight buttons at one time. 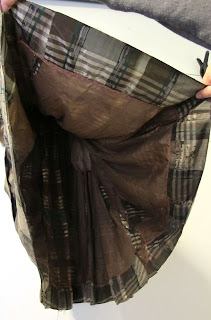 The silk is disintegrating all over, with the shoulders having the worst damage. 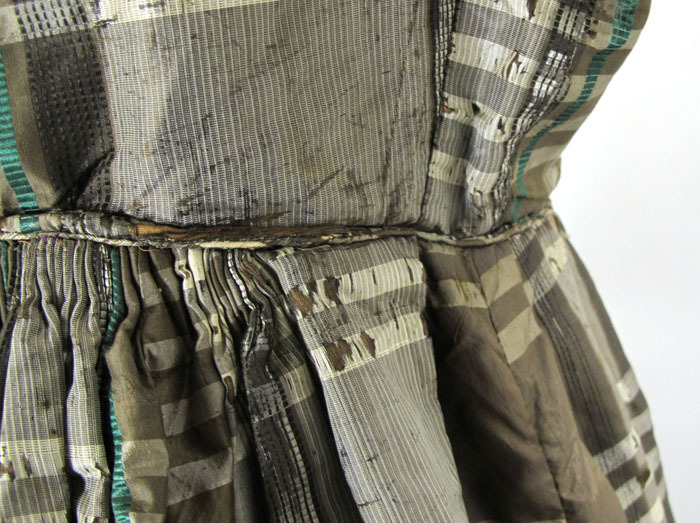 They aren't making any more of these 19th century dresses, so even in this condition, it is a rare and unusual piece of history that you don't want to miss. Good Luck!! Yes, this dress is ripped to shreds thanks to time but look at how the trim is applied! See the pocket in the dress (thank you, seller!)? Look at how the dress closes! 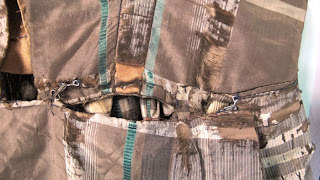 This is why even old tattered clothing is important - it can still show you the construction and techniques used in clothing. 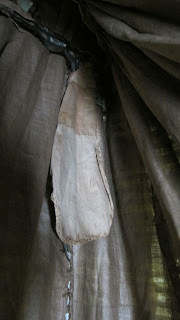 From that construction, you can often tell something about the time period - did they use a sewing machine or not? What type of material? Is it lined in linen or cotton? Each of these questions are important because it tells us a lot about what was going on at the time - whether there was a war and silk just wasn't available or if a new technology like the cotton gin brought down the price of cotton to the point it was the fabric you wore. 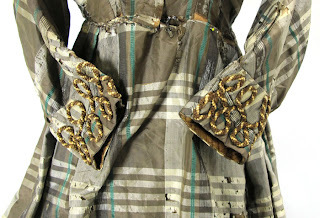 Fashion history is not about the clothing - it's about the time period the clothing was worn in. 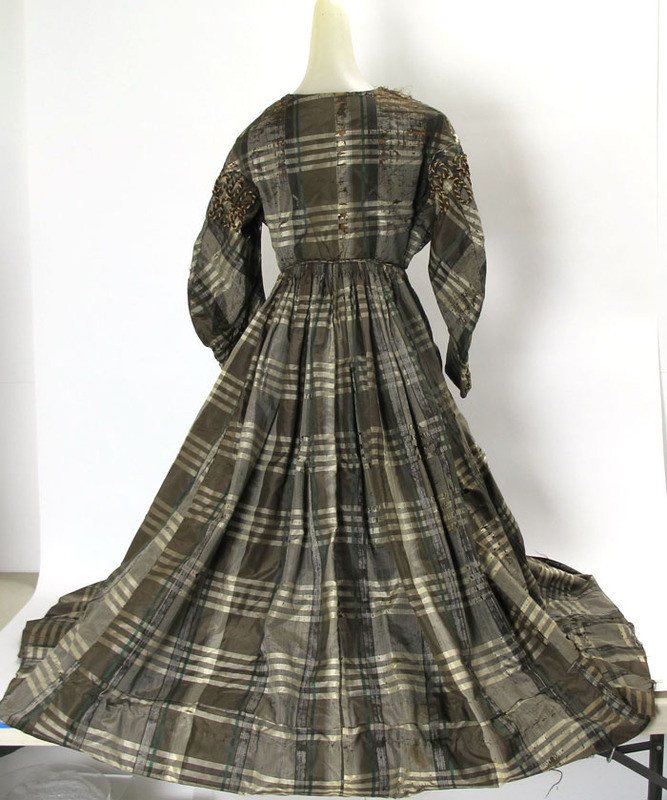 This particular dress is most likely 1865-1867. So, just after the American Civil War. You can tell by the waistline and the shape of the sleeves. 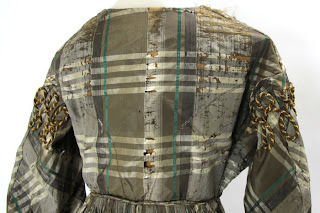 The trim is similar to what was worn earlier but the waistline is pretty high. 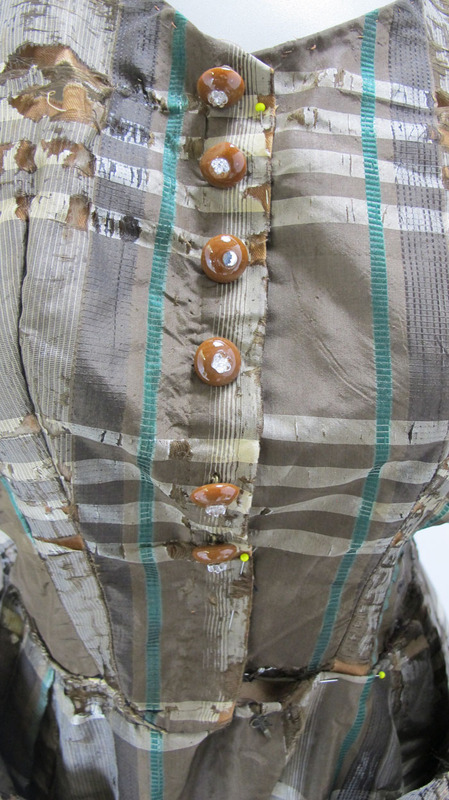 The buttons are not original to the dress.